The oldest leather shoes ever found were made from cowhide and stuffed with grass (no joke). Thankfully, a lot of things have changed with work footwear in the 5,500 years since those work shoes were made. These Chippewa Men’s Black Odessa 20028 USA-Made Boots ar ... (see full details) (see specifications) #CHP20028. The oldest leather shoes ever found were made from cowhide and stuffed with grass (no joke). Thankfully, a lot of things have changed with work footwear in the 5,500 years since those work shoes were made. These Chippewa Men’s Black Odessa 20028 USA-Made Boots are made with present-day comfort and durability. Crafted with black odessa leather uppers, the oiled leather makes these Chippewa boots resistant to water, stains, and damage, while remaining soft and flexible. Inside these American-made boots, you’ll find Ruby Dri-Lex lining. This soft lining draws moisture away from your feet and is abrasion-resistant, making it extra tough while keeping your feet cool. Dri-Lex is also the only knit lining approved by the American Podiatric Medical Association. The 5 iron Texon insoles are durable, lightweight, and flexible, and they're also antimicrobial and moisture-wicking to prevent odor, keeping your feet comfortable and dry all day. With Vibram 109 logger outsoles, these logger boots are hard-hitting and hard-wearing. These Vibram outsoles also reduce shock and foot fatigue for all-day wear. The logger outsoles of these men's boots are specifically designed to provide maximum traction in wet or dry conditions. The sewed seat construction makes these black boots extremely tough, while providing excellent traction and stability. What makes sewed seat construction different is that a welt is sewn all the way around the bottom of the USA-made boots and then cemented from toe to heel making it extremely durable and strong. The oldest leather shoes were found in an Armenian cave, but Chippewa footwear like this is USA-made at the Carthage, Missouri, factory. 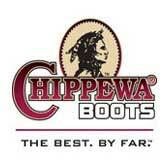 They proudly carry Chippewa’s “Hand Crafted in USA” label. Don’t get a pair of work footwear that's made with prehistoric technology! These Chippewa Men’s Black Odessa 20028 USA-Made Slip-Resistant Boots are made for the modern man. The foot part is just like any other Chippewa fantastic!! However, if you are used to wearing the 9" loggers like I am these are not very comfortable. The rolled edge on it digs into the back of your calf and is very painful. Would not recommend. I ordered these boots for work to wear with shorts, needed something a little shorter than my loggers to wear with shorts. First time trying them on they were just a bit big and a little stiff, however I wear a wool sock with a liner sock so I think the should fit just fine. I ordered my true size. After heating them up in front of stove and applying beeswax for waterproofing they have softened up considerably. They arrived in good time, less than a week. The reason for three stars is that I just got them need some time to actually wear them at work. After a few weeks will add to review and hopefully increase the star factor. I'm tough on boots, summer boots generally don't last me a year. I bought a pair of these early last summer and they're still going strong, so I bought another pair to break in. Good leather, no fluffy lining to tear or break down, I dose em good with mink oil so the leather is cut and scuff resistant. Good boots, light and they're USA made. Boots are well made, comfortable and good looking. I have a pair of these in brown that I like a lot, decided I needed black ones as well. As you can see, I really like the quality of these Chippewa boots - they're made by Chippewa shoemaker elves or something. These work boots are lighter in weight than the 'almost up to your knees' variety, but just as tough. I've got zero complaints. Chippewa Boots: Men's USA-Made 20028 Black Vibram Logger Sole Work Boots is being added to your cart.